View of one of the two ‘legs’ of a gigantic “V” (for ‘Vote’ and ‘Victory’) formed in Barcelona last Sept. 11, Catalonia’s National Day. 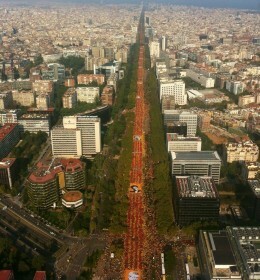 Demonstrators drew the Catalan flag: four red stripes on a yellow background. Catalonia’s independence is one of the five top challenges the EU is currently facing. A nation of 10 million people has held four years of huge mobilizations, leading to “Europe’s biggest rally ever” on Sept. 11th of this year. 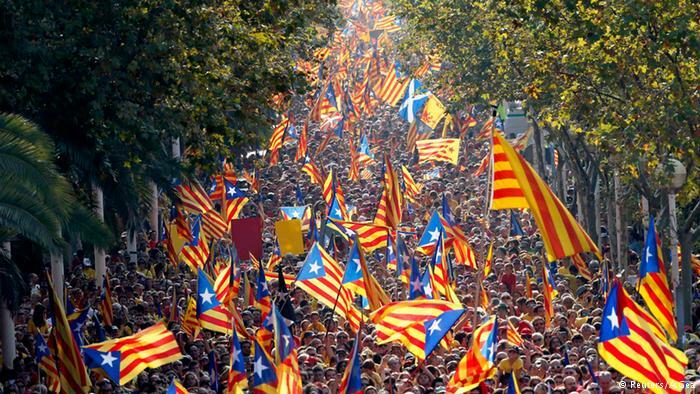 With the strongest national language among Europe’s “unofficial languages” (or at least, without State national language status), Catalan shows is robust and healthy after centuries of persecution by both French ‘Universalism’ and Spanish centralism.